This is the first meeting of our Simons Program for this spring, with meetings centered around the scientific interests of Simons Visiting Professor Charles Bennett. 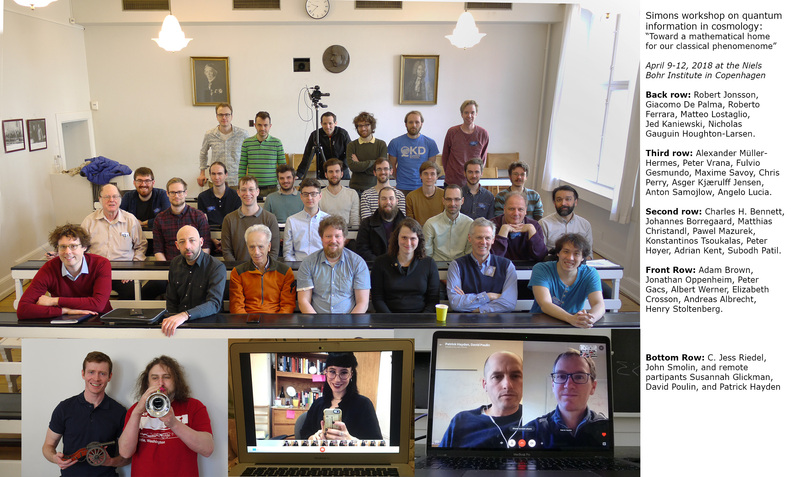 April 9-12 we are hosting a workshop on hot topics related to quantum information and cosmology. Emergence of classical phenomenology from quantum laws via decoherence (the "quantum Darwinism" or "spam" paradigm), which seems to require thermodynamic disequilibrium, but could perhaps occur without it. How to avoid the Boltzmann brain problem, which seems to plague cosmologies that equilibrate at nonzero temperature, either by finding a way to produce structures sufficiently organized to be anthropic observers even at equilibrium, or by finding plausible cosmologies with a plentiful supply of disequilibrated places. How to think about the experiences of an observer (Wigner's friend) within an unobserved superposition, which has become more than a philosophical conundrum because of its bearing on the Boltzmann brain problem. How these problems might be complicated or mitigated by a mechanism for quantum emergence of spacetime.